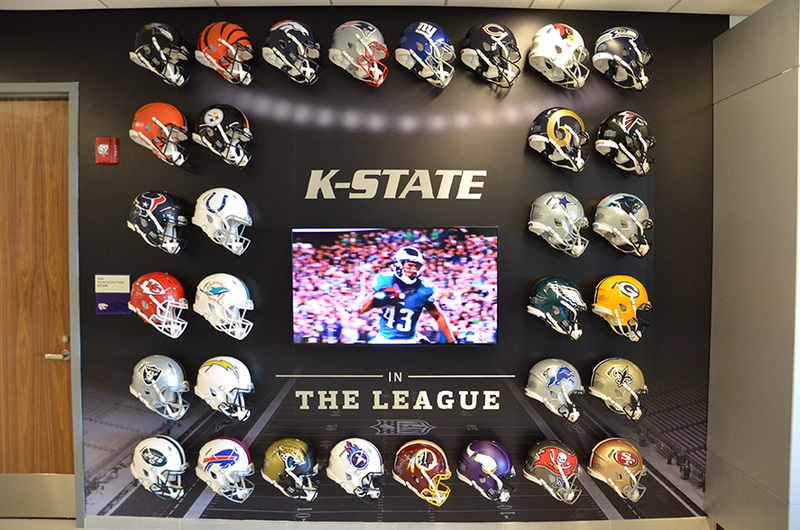 Just before the first game of the 2015 Football season, Kansas State University completed the construction of the new Vanier Family Football Complex – a four-story facility that provides student-athletes and coaches access to world-class resources, equipment, and facilities. The construction of the Vanier Family Football Complex was on an extremely tight schedule. It started on the day after the last game of the 2014 season with the demolition of the old Vanier Football building and was completed in just nine months. 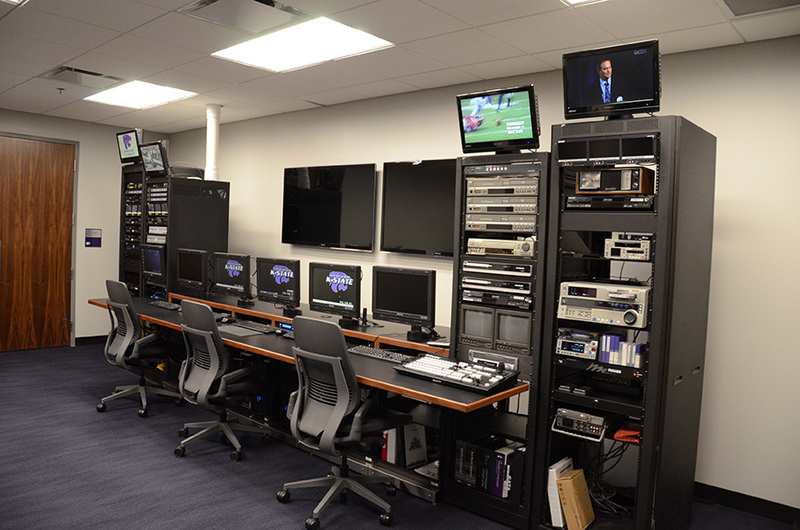 To meet the deadline, Kansas State turned to construction partners who had proven experience with large fast-track construction projects including Alpha Video Sports & Entertainment to design and integrate all of the audio, video, and broadcast systems. The Vanier Family Football Complex is a state-of-the-art athletic center that includes facilities for the football team like the coaching video suite, locker rooms, coaching offices, team meeting rooms, and football players’ lounge and has amenities for all student-athletes including weight room, sports medicine center, nutritional support, and academic resource center. The weight room even includes a two-story plyometric ramp. Mike Ford, Alpha Video’s lead engineer on the project, said, “Designing the audio and video systems for this facility was a challenge. The building contains over 80 meeting spaces. 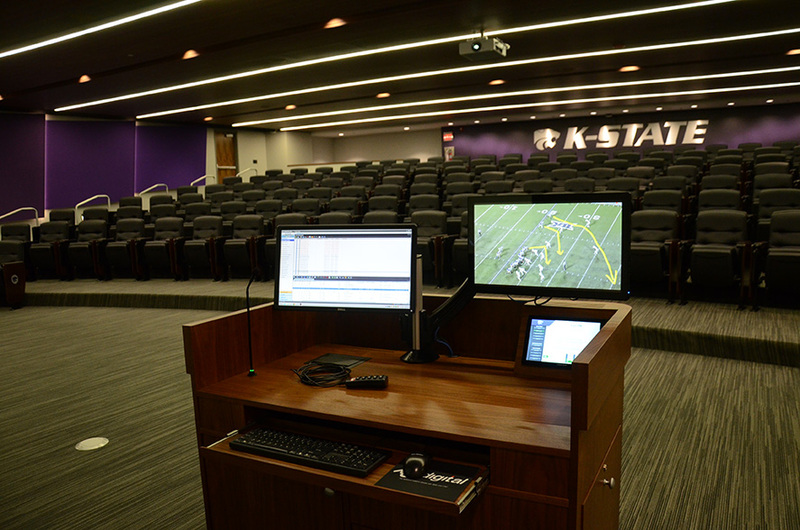 In addition to the conference rooms, all of the coach’s and administration staff’s offices include presentation technology. 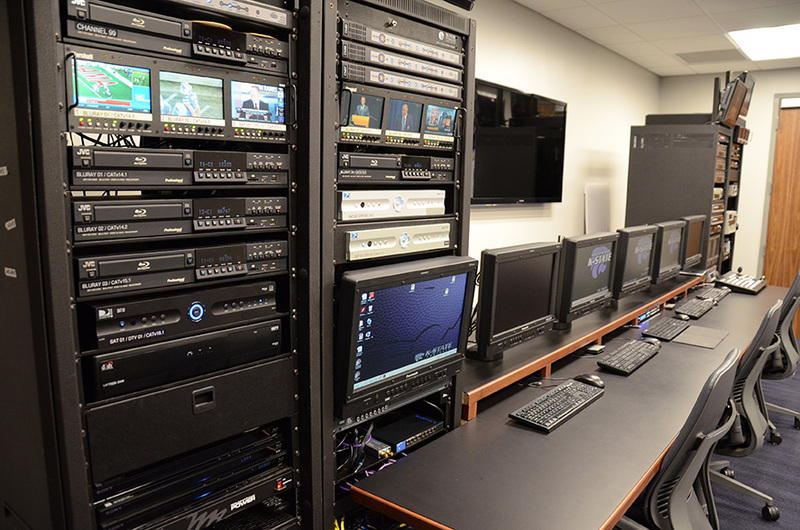 We designed the connectivity so that the coaching video suite is able to communicate to the broadcast systems used throughout the stadium.” This includes five different points of connectivity reaching to three different buildings allowing communication between presentation spaces in the Vanier Family Football Complex, the in-house broadcast services of the West Stadium Center, and the network partners located at the exterior production truck area. The main entrance to the building opens to the second floor and leads to the Grand Staircase which has an eye-catching video wall at the top of the staircase. The video wall uses four 82” Samsung displays in a 2x2 configuration and shows game replays, highlights, welcoming messages, and informational content. The area around the Grand Staircase is a gathering space for student athletes and the attractiveness of the space helps recruit future athletes. 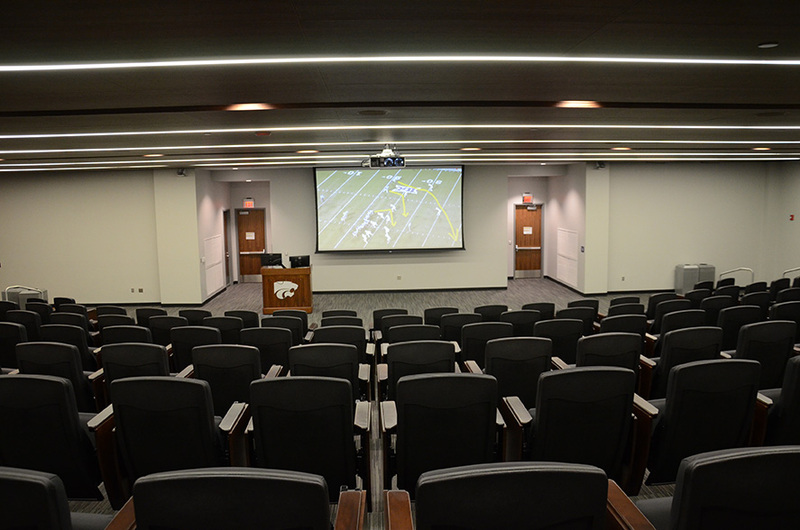 One of the show piece rooms in the Vanier Family Football Complex is the 170-seat theater used for activities like press conferences, athletic department meetings, and coaching clinics. The theater is fully equipped with presentation technology including a Planar 22” multi-touch screen with a Pointmaker annotation system, Wolfvision document camera, Sony Blu-ray player, Tannoy speakers and subs, along with Shure wireless microphones and Crestron touch-screen panel and control system. Video is presented on a Da-Lite 184” diagonal 16:9 motorized screen from a Panasonic 7000-lumens WUXGA projector. As anyone who has done a lot of weight lifting can tell you, a rocking audio system in a weight room is almost as important as the weights – keeps you motivated! The Strength and Conditioning Center in the Vanier Complex is a difficult acoustical space, combined of a large two-story room with glass walls and a smaller one-story work-out area under a mezzanine. Alpha Video designed a customized audio system using Lap Gruppen amps, Symetrix digital signal processors, three Tannoy Column arrays, 13 Tannoy pendant speakers, four wall-mounted Tannoy loudspeakers and a Tannoy four cabinet sub array for low-frequencies. Regarding the weight room, Eilert commented, “It’s a great audio system. The strength guys don’t even have to turn the volume all the way up before the building starts rocking and we feel the music on the fourth floor”. A Shure wireless mic system and wireless Crestron touch screen control system was installed so the strength coaches can easily communicate and control the sound system as well as show demo videos on any of the 11 displays installed throughout the room. The Complex includes five conference rooms, a large team meeting room that can be separated into two smaller meeting rooms, and seven position meeting rooms. 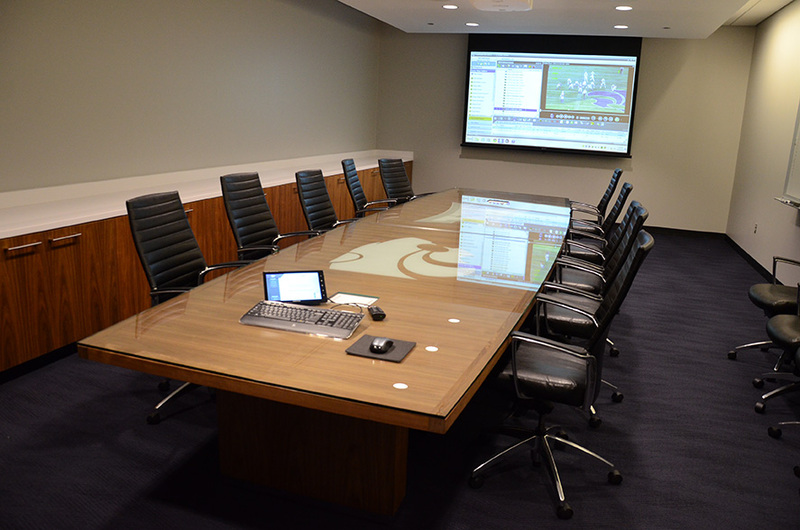 All of the position rooms and the large team meeting room are fully equipped with presentation technology including a Planar 22” multi-touch screen with Pointmaker annotation system, Panasonic projector, Da-Lite screen, Wolfvision document camera, Sony Blu-ray player, XOS PC, Tannoy speakers, and Crestron touch-screen panel and control system. Alpha Video was available 24 hours a day to help move the project forward in a positive direction. Because of their experience with similar large projects like this one, they were able to “peek around the corner” and solve issues even before we knew the issues existedl.